To re-send Bonjoros, you can use our Re-send function in your Bonjoro account (SET UP HERE) for simplicity, however if you want more customisation you can also do this via your email. To learn how, read on. There are two ways to do completely custom Auto-Resends. You can trigger and deliver these from your email automation in your CRM / mailing list - see how here - or you can re-send directly through your email client. We've shown plain-text resends of unwatched Bonjoros after 3 days to increase views by 10 - 20% on average. This feature will soon be available in the Bonjoro platform, but some users may prefer to run this through their own email client for extra control. 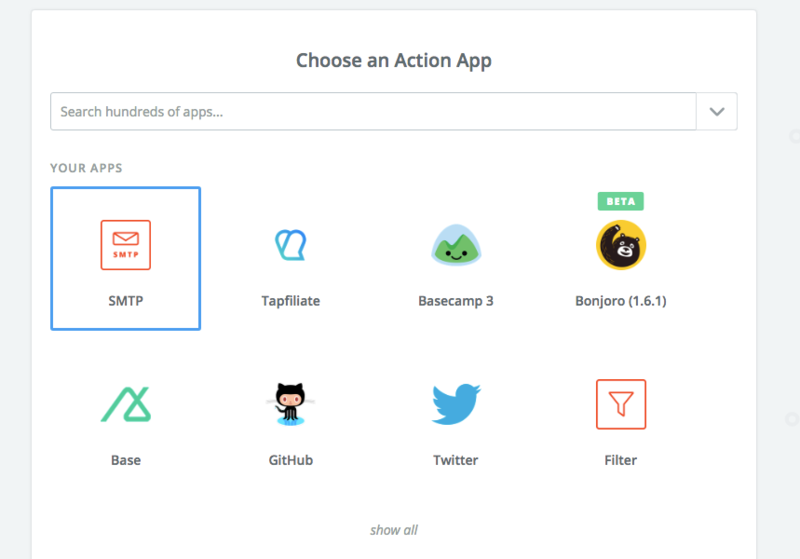 This system involves a 4-stage app in Zapier, which requires one of their paid plans. 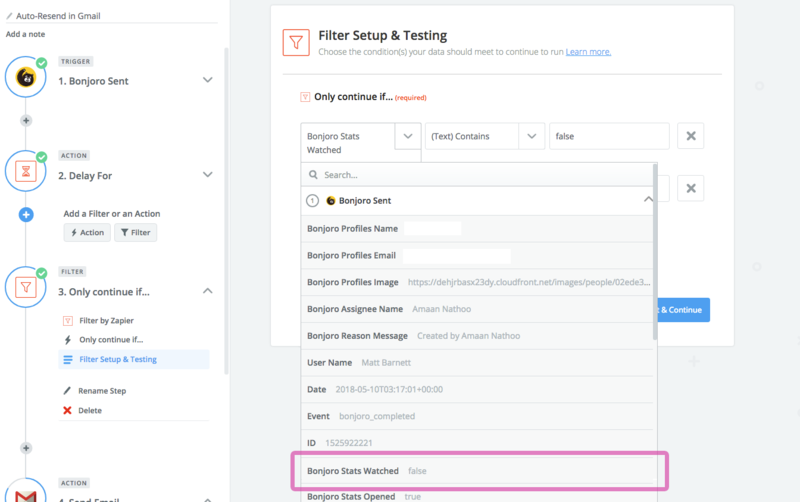 Using Zapier - set up a workflow with "Bonjoro Sent" as the trigger. 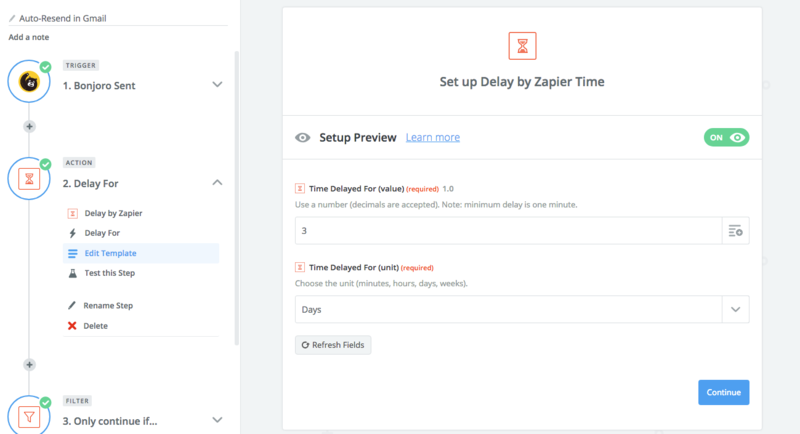 Add one of Zapiers custom triggers "Delay". Select "Delay For" as the action and on Edit template choose how long you would like to wait before you check to re-send any unwatched Bonjoros. We use 3 days. Note - you'll find this by clicking on the 1.Bonjoros sent and then select from the variables. What you are doing here is essentially waiting 3 days, then re-checking your Bonjoro to see if it is now watched. Bonjoro Assignee Email > Contains > Your email. If you are a team, as the next step will connect to a Gmail account to re-send the Bonjoro, you need to set up one of these zaps for each team member, and the filter and Gmail account needs to chance to each team member. This ensures that only Bonjoros that Stephanie originally sent are resent from Stephanies account, while only Bonjoros that Brian originally sent are resent from Brians account. There are a number of choices here, if you're a Gmail user go ahead and connect that. 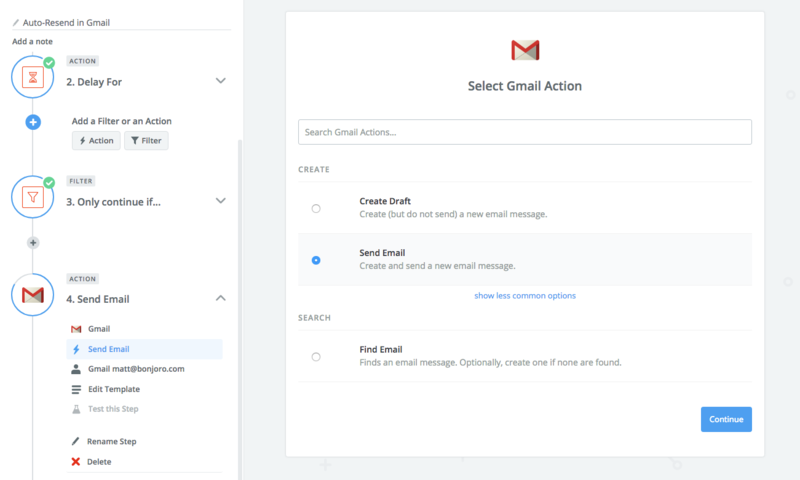 If you are not a Gmail user, the best thing is to use the Zapier SMTP email function (there is also an outlook app coming soon). Both SMTP and Gmail work in roughly the same way, though SMTP only allows plain text. I'll run through the options for Gmail, but select the same variables is using SMTP. Use "Bonjoro URL" to place your original video in the bogy text. You can also use the persons name as a variable if you have it.